Minnesota Historical Society Press, 9780873518642, 256pp. It’s hard to believe there was a time when you couldn’t go out for Chinese food in Minnesota, but there was—until brothers and entrepreneurs Woo Yee Sing and Woo Du Sing opened their Canton Restaurant (later called John’s Place) in Minneapolis in 1883. Chinese, Japanese, Thai, Indian, and Cambodian immigrants have left an indelible and flavorful mark on our collective culinary history. Many cooks sought not only to make a living but also to preserve the memory of their homeland through the dishes set before family and patrons alike, to the great benefit of diners from the Twin Cities metro area to Duluth to the Red River Valley. 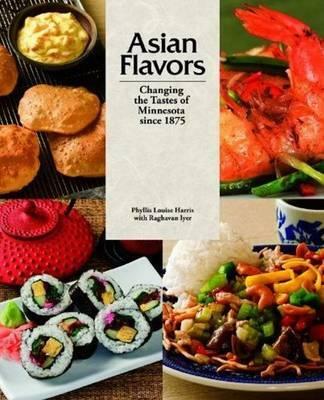 Asian Flavors includes interviews with pioneering chefs, features on beloved restaurants, stories of farmers and food businesses, and, of course, more than 150 treasured recipes that have nourished and inspired Minnesotans. Try Dar Cheen Chicken from Wing Ying Huie’s Chinese Lantern in Duluth, or Supenn Harrison’s egg rolls made famous at her state fair booth beginning in 1976, or Reiko Weston’s Sukiyaki from the original Fuji Ya in Minneapolis. Let Asian food experts Phyllis Louise Harris and Raghavan Iyer take you on a tour through this comprehensive history, lavishly illustrated with historical and contemporary photography, from the Philippines to South Korea to Nepal, from the 1870s through today. Phyllis Louise Harris teaches Asian cooking and was food editor of Asian Pages for two decades. Collaborator Raghavan Iyer is author of Betty Crocker’s Indian Home Cooking, The Turmeric Trail, and 660 Curries. They are cofounders of Asian Culinary Arts Institutes in Minneapolis.